Mini nukes sure look a lot more high-tech on the inside. Valcrow of the 3D printing blog Redicubricks dug the fact that Bethesda’s Fallout Anthology came with a mini nuke case, but they weren’t interested in playing the older games. 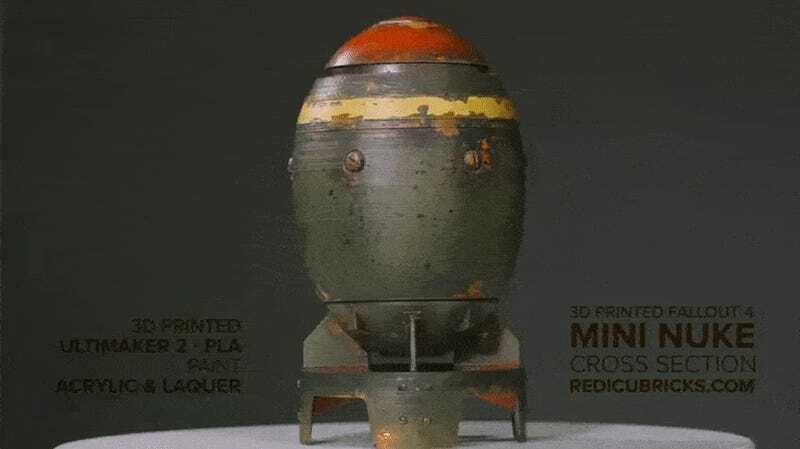 So, of course, they did what any other sane person would and decided to print their own mini nuke, complete with guts. While the insides are pretty clean, the mini nuke’s shell has that familiar Fallout-y wear and tear—something they achieved with a combination of acrylic paint, masking fluid for the rusty bits, and lacquer paint for the metally bits. There are more photos and one video below.